One night, Lucy's angry stepfather takes eight-year-old Lucy from the little room she has been locked away in for years, puts her in the backseat of his van, and leaves her in a remote English wood. Lucy has learned to read in her room years, and her only knowledge of nature comes from books. When she experiences the miraculous outdoors directly, she is full of wonder at the beauty and life all around her. Most of all, she is relieved to be free of her stepfather. Lucy discovers freedom, magic, and an extraordinary friendship, her first ever, with a surprise visitor, nine-year-old Will, who, bewitched by her wild eyes, long black hair and strange speech, brings her live chickens to give her eggs, food daily, and a recorder to imitate the wood's sounds. Lucy feels safe and at home for the first time, sleeping inside grandpa tree's hollow trunk, and playing woodland music during the day that puts a spell on all who hear it. Lucy's greatest fear is that she will be found. But the police do eventually capture her and take her to an orphanage run by strict nuns where the bullying and fascination for toys and television seem strange to Lucy who sees this man-made world as another prison, cut off from outdoor miracles. She eventually manages to escape back to the woods where she and Will, inside grandpa tree, experience magical guidance on how to continue their journey. Book 2 will be: Lucy and the Forest School of Wonder. Advance Praise Lucy’s step-father didn’t like her. In fact, he called her Nuisance. Never Lucy, just Nuisance. He even locked her in her bedroom, not allowing her outside. It was like a prison. So when her step-father took her deep into the woods and left her there, Lucy felt like she had just been set free. Just like the trees and the meadow full of wildflowers, even the fresh running brook – Lucy was now free. She was no longer afraid because she knew that the woods would take care of her. And it did, as did Will, a boy just little older than Lucy, who befriended her and brought her much needed supplies of food. All was well in Lucy’s world until others discovered that she was living alone in the woods. The police came and took her away. They tried to convince her that it was for her own good. The woods was not a safe place, or so they said. But Lucy knew better. And so did Will. When Lucy was trapped in an orphanage, Will found her and helped her realize that she, Lucy, the Wild Child as he called her, needed the woods as much as the woods needed her. This story is absolutely beautifully written, tender and compassionate. I haven’t read such a touching story since my mother gave me a copy of Gene Stratton-Porter’s A Girl of the Limberlost. 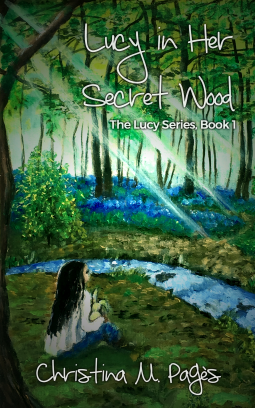 Christina M. Pagès’ Lucy in Her Secret Wood is a real classic, a story that gently opens the reader’s eyes to the powerful connection between humans and nature, as well as the power of music that is like a delicate web that intertwines between all of life. Powerful and unforgettable. Reviewed by Emily-Jane Hills Orford for Readers' Favorite - FIVE STARS “Lucy In her Secret Wood is a beautiful tale, charming and poignant, reminiscent of classical children’s literature that transport us to magical realms.” Mark Bomback, Screen Writer: Dawn of the Planet of the Apes, Race to Witch Mountain “Lucy calls us all into the woodlands. Through her eyes, and her mother’s voice, we leave behind our tiny windows and see through her wide window, renewing our connection to Mother Earth.” Susan Squellati Florence Susanflorence.com, Author: Let Happiness be Yours A Stunning Absence “Lucy’s release into nature brings her a nurturing web of relationships. This is a story of vital interconnections, all illuminated by a memorable girl.” Charlene Spretnak Author: Relational Reality, Co-Founder of the U.S. Green Party Movement “I, too, was "locked away" in a small corporate office. But when I moved into a remote cabin, my world became endless skies and stars, Dreams filling my nights led me to my passion and a new career of sculpting wildlife friends. This wonderful story for all ages encourages us to follow our dreams.” Bud Bottoms, Sculptor, Author: Kid Ethics: From A to Z. Grandmother Mountain “Pages’s magical story will give all ages a joyful connection with nature.” Robin Gerber, Author: Barbie and Ruth. On a scale of 1 to 5 this one is definitely a six . Descriptive,imaginative and soul fulfilling. I loved it. And I already want to read the sequel. The characters are just so carefully crafted you feel like you are experiencing the story.